The below is a sampling of activities outside of traditional scholarly publications or conference presentations that I’ve been involved in as a professor. They include projects I have done or engaged-learning class projects for my students. Discover Downtown Charles Town, Fall 2014 – Students in my Strategic Communication class took on local non-profit DDCT as their class client. They prepared a strategic communication campaign plan for the client based on the client’s needs. Proposals were presented to the client along with professional materials for implementing proposals. 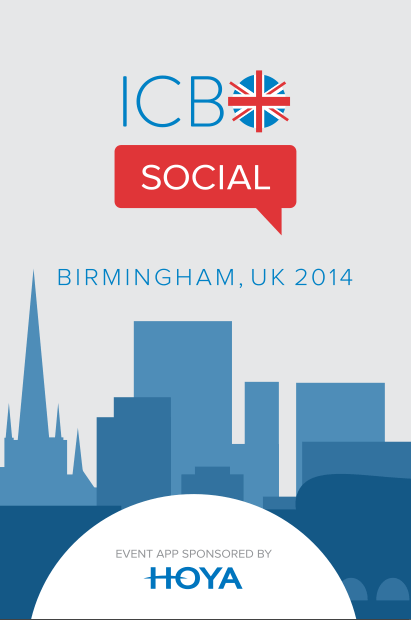 International Congress of Behavioural Optometry (ICBO), September 2014: I had the honor of serving as the Social Media Director for the ICBO 2014 conference in Birmingham, England. In this role, I was responsible for planning and executing the social and digital experience for conference attendees, speakers, and exhibitors. I used the DoubleDutch platform to build and launch the mobile conference app, ICBO Social. I wrote and coordinated all messaging surrounding stakeholder buy in, launch, and onsite promotion of ICBO Social. I planned and executed onsite app engagement strategies resulting in successful engagement stakeholders and enhanced interaction between attendees and exhibitors. And I provide onsite support for end users. This project was sponsored by a grant from the Shepherd University Foundation. American Conservation Film Festival, November 1-4, 2012: Students in my “Social Media for Social Change” class in the Department of Communication at Shepherd University worked to promote the American Conservation Film Festival’s 10th anniversary through social media. Students published and promoted a blog on conservation and the environment, ran the @ACFF2012 Twitter account. At the event, students ran booths promoting a “Tweet Your Review” Twitter campaign. Google Online Marketing Challenge, Spring 2012: This is an international competition run by Google using their Adwords marketing product. Teams at universities are given $250 to use in a search engine marketing campaign. I’m the faculty representative for a team of UVU students. Our team worked with the OEP Foundation, a non-profit organization based out of Southern California, to increase awareness of vision therapy. #UVUSOCIAL, Fall 2011: I planned and put on this engaged learning experience in tandem with the UVU PRSSA. #UVUSOCIAL was a social media speaker event at Utah Valley University featuring Cory Edwards of Dell Computers. During the Fall 2011 semester students in my Comm 350R Social Media class were responsible for all of the social media promotion and live coverage (through live blogging and video streaming) for #UVUSOCIAL. Co-moderator, 2010-2011 #UTalk: a weekly Twitter chat focusing on social media issues relevant to the people of Utah. #Utalk provided opportunities for both social media newbies and evangelists to learn, share, and network. #UTalk is not being hosted at this time.